Could we be looking at Luke Skywalker's (Mark Hamill) robotic hand in Star Wars: Episode VII with the latest photo revealed by director J.J. Abrams? As you may well know (SPOILER ALERT), the story of Star Wars: Episode VII is said to revolve around Luke's severed hand, the discovery of which sends Han Solo and Chewbacca on a new mission. And we already know that he has a robotic hand from Star Wars: Episode V - The Empire Strikes Back that looks very much like the one in the photo. So, are we getting our first sneak peek at Luke Skywalker in Star Wars 7? 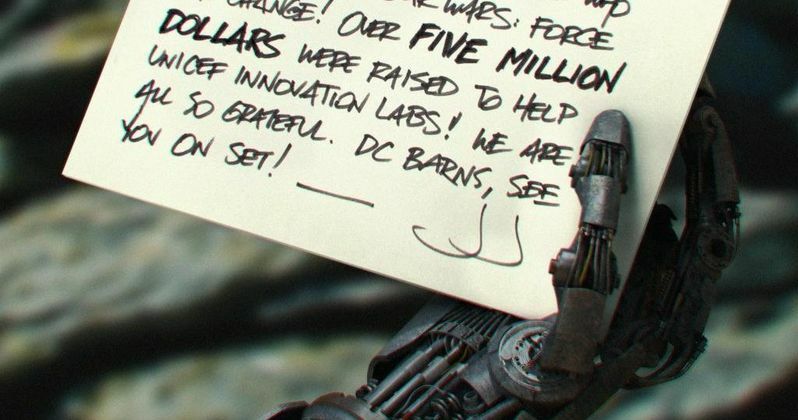 Or is this merely just some old droid's hand, used to hold up a note from the director thanking everyone who contributed to the Star Wars: Force for Change program, which has pulled in over $5 million to support Unicef's Innovation Labs. With an exciting initiative that offered a chance to win unique rewards and prizes, including a once-in-a-lifetime grand prize, FRgAKNrSBIT2km|Star Wars: Force for Change raised $4,261,410 USD for the United Nations Children's Fund (UNICEF). Contributions were received via fundraising platform Omaze from citizens of 125 countries and enough money was raised to support the equivalent of 7-8 new UNICEF Innovation Labs. The grand-prize winner was D.C. Barns of Denver Colorado, who shared during a donor video chat that the first time he saw FRgAKNrSBIT2km|Star Wars when it opened in theaters in 1977, when he was only five. "I loved it! ... I just couldn't get it out of my head of 35 years." "This! This is my new favorite FRgAKNrSBIT2km|Star Wars moment!" D.C. will enjoy a trip to London for himself and a guest, a behind-the-scenes visit to the FRgAKNrSBIT2km|Star Wars set, and will be fitted with a costume and filmed for a scene in Star Wars: Episode VII. UNICEF's current network of 14 Innovation Labs help create sustainable solutions to critical issues facing children around the world in the areas of nutrition, water, health, and education. The funds raised through FRgAKNrSBIT2km|Star Wars: Force for Change will impact the lives of children around the world, through projects like MobiStation, a portable, solar-powered educational kit to ensure children have access to quality learning anywhere, and Rapid FTR (Family Tracing and Reunification), a mobile phone application that helps reunite separated and unaccompanied children with their families in natural disasters. Disney committed an additional US $1 million to support the launch of FRgAKNrSBIT2km|Star Wars: Force for Change. FRgAKNrSBIT2km|Star Wars continues to inspire generations of dreamers and doers to use their creativity to accomplish great things. FRgAKNrSBIT2km|Star Wars and Lucasfilm were built on the belief that in uniting creativity with innovation, you can make the impossible possible.